This is the second installment in my photo blogs of houses of worship whose architecture I like. 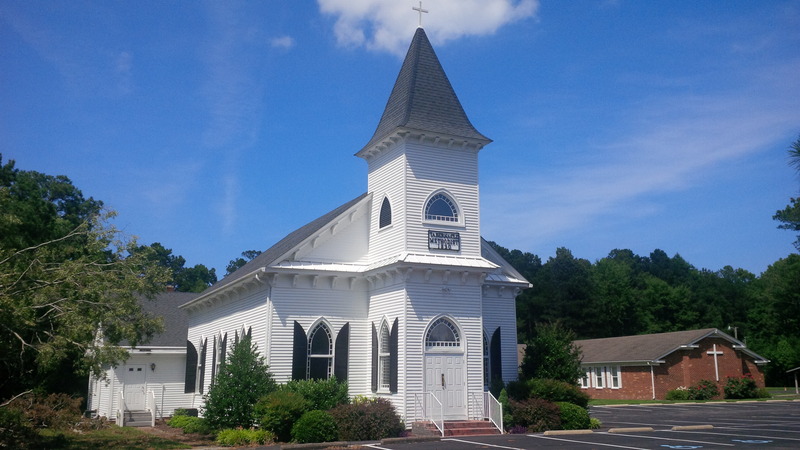 Tabernacle United Methodist Church is located in the Sandbridge area of Virginia Beach, Virginia. This sanctuary is a white wood design that was popular among many Protestants in the 19th century, particularly Methodists. (This building was built in 1830). I particularly like how the building has an entrance that juts forward and then continues upward into a steeple. This congregation has also kept their building spotlessly clean and carefully landscaped. This is one of most eye-catching country churches that I have ever photographed. Posted on October 27, 2014, in Photography and tagged architecture, buildings, church, churches, houses of worship, Methodist, photography, sanctuaries, sanctuary, Tabernacle, Virginia, Virginia Beach, worship. Bookmark the permalink. 1 Comment. I like what you are doing with this. Great idea.